Though it's warmer today, a winter cold is setting into my throat and chest, ugh! But one of the best parts of winter, I think, is snowmen! I can't get enough, so I am sure you will see them on the blog as often as I can find ones to share. Here are a few edible ones, though not donuts like yesterday (YUM! ), still just as cute and sweet! 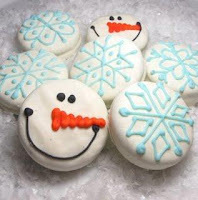 These adorable snowmen and snowflakes are just piped on white fudge covered oreos! These are posted by the decorated cookie - for those that haven't been over to that site, GOOOOOO! She's amazing and give step-by-step instructions which are fantastic. Takes all the anxiety over starting up something so beautiful! Ok, this one has more than just snowmen, but no less fantastic! 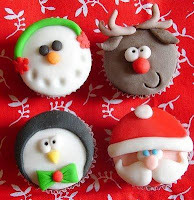 I found this on a Spanish website (colorparty.blogspot.com), so I hope I give the right credit because I can't read much Spanish ;o) Though I love the snowman here, I have to say I am loving the reindeer and Santa the best! Oh how much fondant I will need to make this year!